Can I Learn to Invest Safely in Forex Trading? Don't Put Money in Forex Trading Until You Read This! "PROVEN Online Forex Trading Advice Will Make You Rich"
"130% Return on Investment in Past 30 Days"
"Stop Losing, Start Earning - Trading Alerts Bring Fast Profits"
Have you heard claims like these and wondered if they're for real? Let's face it, it's hard to decide what to do with your money. Maybe you are like me and have taken a real beating in the stock market. Looking at my account statements makes me wonder if I should just be sticking my money under a mattress. You want to do better, but you aren't sure if it's possible and whose advice to trust. Can you make good money in Forex? Enough to make a difference in your life? Who can explain it best? There are tons of experts selling ebooks, teaching courses, providing tips via subscriptions. But is the talk all hype, designed to sell books, ebooks and trading software to naïve investors? I mean, come on, everyone is telling you to listen to them, like they are your new best friend. What kind of time, brains, or luck are really needed to make money from Forex trading? I wanted a Forex expert to be honest. But I didn't want just one expert's opinion, but several. Because if one person says something, I might believe them. But if three out of four people voice similar opinions, that means a lot more. So I emailed and called Forex Experts and pestered them with my questions. Their answers are now available in a special report that offers a fresh and valuable perspective on Forex. This is NOT an investment advice book to help you place trades based on the contents, instead it will allow you to steer clear of scams and plan an investment strategy that meets your needs and goals. 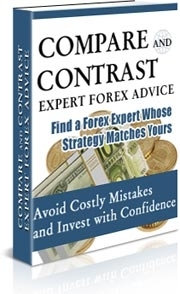 "Compare And Contrast Expert Forex Advice" does what too few Forex books do these days... it gives you more than one perspective on Forex trading. This objective overview of Forex trading is just what the doctor ordered for those starting to trade or thinking about getting started in trading. Even as an experienced trader I have to admit that I found many time-tested nuggets of trading wisdom that simply shouldn't be ignored. Thanks, Diana, for making this book available. Thanks so much for Compare and Contrast Expert Forex Advice. Now I've got some confidence in the advice I'm getting. You took the worry out of my decisions with this book. You know how much I hate a scam! Discover how to tell if a "Too Good to Be True" Forex strategy really is "Too Good to Be True"
P.S. In case you had any doubts about this being a balanced report, telling you the good and bad aspects of Forex trading... When I originally wrote this report, I realized Forex trading was not right for me at the time. If/when I feel the time is right, I'm going to reread the report so I can choose the best course of action. I know others who read this report and are currently trading.